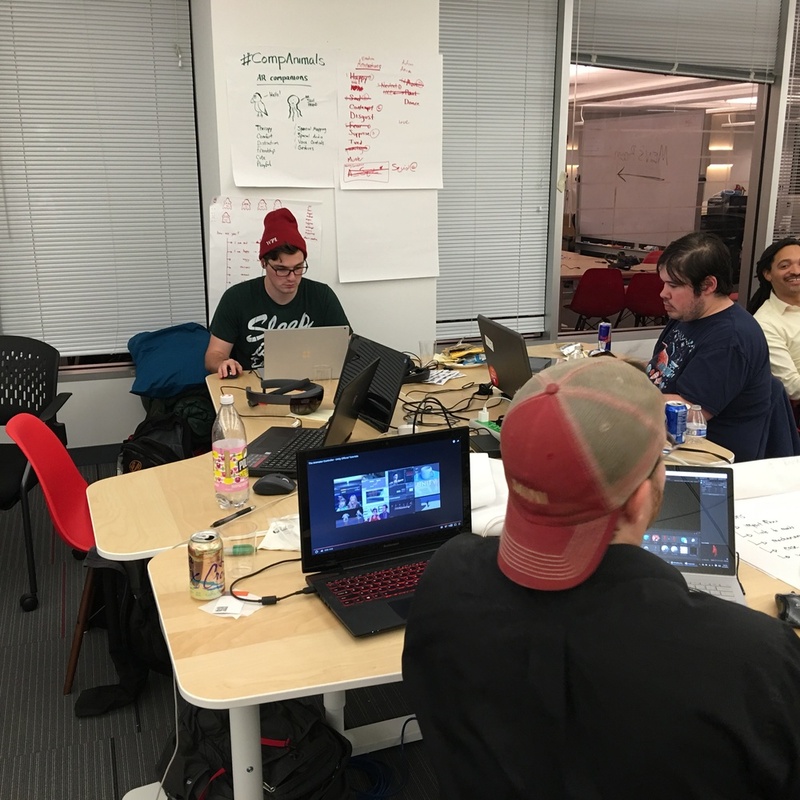 A while back I found out about a hackathon sponsored by the Boston AR and Boston VR groups. Microsoft had agreed to bring in a bunch of the developer headsets and let us hack up some new apps for them over the course of the weekend. My coworker and I both applied. I had almost forgotten about the whole thing until we both got invites the weekend before the event. I'm so glad we did, because it was an absolute blast. Friday night we were introduced to the platform and given an overview of how to use them, what the goals of the weekend were. Shortly after we were turned loose to eat dinner and form our teams - which involved walking around pitching our idea to potential team members. Scott, a walking, idea pitching, billboard, and myself. Our original idea was to have sort of a virtual therapy animal. A hologram animal you could interact with, talk to, and play games with to help deal with stress and anxiety. We started out with the idea of a bird and somewhere along the way added the idea of a jelly fish. Scottie and I found ourselves working with two incredibly fun artists - Costas Frost and Derek Johnson. And not only were they awesome artists, but they also brought some fantastic ideas to the team. One of which was our final character, Squiddy. But the other ideas pushed us to adding an emotional reading feature to help autistic people who have difficult time reading emotions. This was done by taking a picture using the webcam and using Microsoft's cognitive services Emotion API to read the faces. Squiddy would then act out the emotion in an exaggerated fashion to help convey it to the user. So that's what we set out to build over the course of the next 36ish hours. There was a lot of laughing, a bit of cursing, and a lot of bad-assery. The result was a demo that had many people who tried it giggling with delight. Here's a short demo of our CompAnimal, Squiddy, in action. Sadly we weren't able to capture the emotion reading; but please take my word for it, it was awesome. Here is our presentation deck. 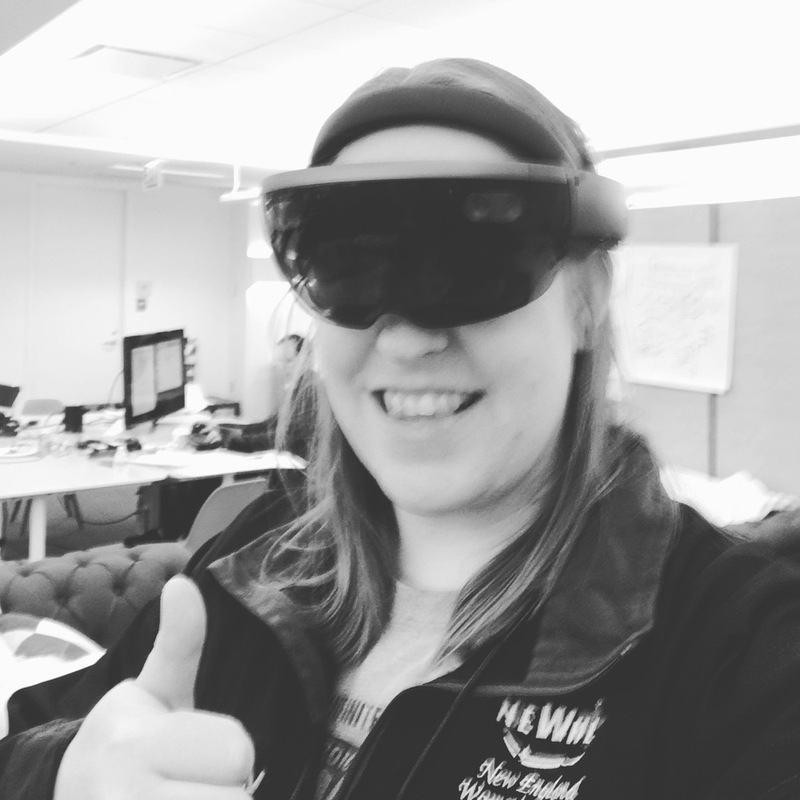 If there was any doubt about how cool the HoloLens is check out this video of me playing Robo Raid on it. The robots just bust through the walls!